A clean, well-ordered oasis in this bustling provincial capital – Dr. Mukwege, his staff, and his patients reek of the triumph of reliant humanity over the unspeakable brutality of the last 18 years of conflict. The particular mutation here – an almost unimaginably vast campaign of sexual violence – has devastated the lives and bodies of tens of thousands of young women. 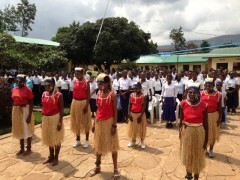 But a visit to Panzi, which is supported by USAID and several other donors, inspires more admiration and hope than despair. In the hospital, Dr. Mukwege didn’t catalogue the horrors of the war or the problems his hospital faces in this, perhaps the poorest country in the world. Instead he spoke about a rare moment that has arrived in the Democratic Republic of the Congo (DRC), the prospect of real peace. They are already seeing the signs that Sexual and Gender Based Violence (SGBV) may be declining, albeit gradually. He wants to extend his efforts into the recently stabilized areas to the North, where he believes thousands of young abused women may never have had access to the types of health and psychological services Panzi and USAIDs large USHINDI project support. And economic activity is picking up, including efforts that provide skills training and employment to young women and men. In Bukavu we also visited the Annunciata Accelerated Learning Center, which offers a three year accelerated elementary education program and skills training to older girls who missed the opportunity to go to school. Getting these girls into school and jobs is a top priority of the government and donors alike. I spoke to the DRC Minister for Gender, Genevieve Kassongo., and she sees educating girls as the key to addressing so many of the challenges facing the DRC – high infant and maternal mortality, extremely low education rates, and the highest rate of extreme poverty in the world. USAID has persevered with the Congolese through years of strife, our partnership could be even better in peace.